Fresh from the dryer quilts are hard to resist for monkeys jumping on the bed. This quilt turned out better than I’d hoped and was a birthday gift for my Mom. The backing fabric I bought from Lori is fabulous…usually I stick with small print fabrics for the backing, but not anymore. Now that the snow has come my boys are going bonkers being inside all day. 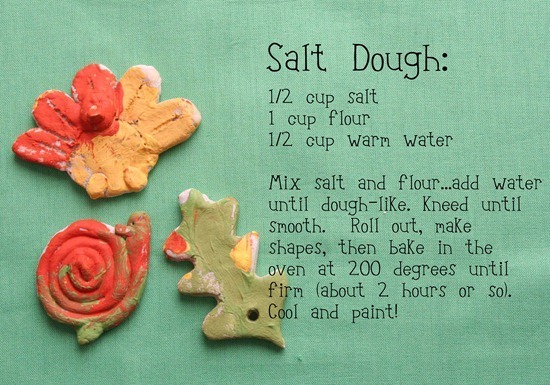 We’ve kept busy doing lots of crafts….salt dough is always a favorite. I got the memo that you want to know what that cute grey bunting fabric is from my last post! It’s Sweetwater’s newest line called Reunion. Yardage comes out in January and pre-cuts hopefully will start popping up soon? Not sure about that one. But that’s what it is! Great quilt. Love the backing fabric. That's such a pretty quilt! I hope you'll stop in at Cranberry Morning and enter my 5-Bar Handcrafted SOAP'n'SUCH GIVEAWAY. Ends Friday night at 10 PM. I just went into a shop in Southlake, Texas "Quilting Stash", they have 2 stores and it had all bright fabrics. I love the quilt and the fabric you used. It is on my to do list. The first photograph of the monkeys on the bed is completely priceless! 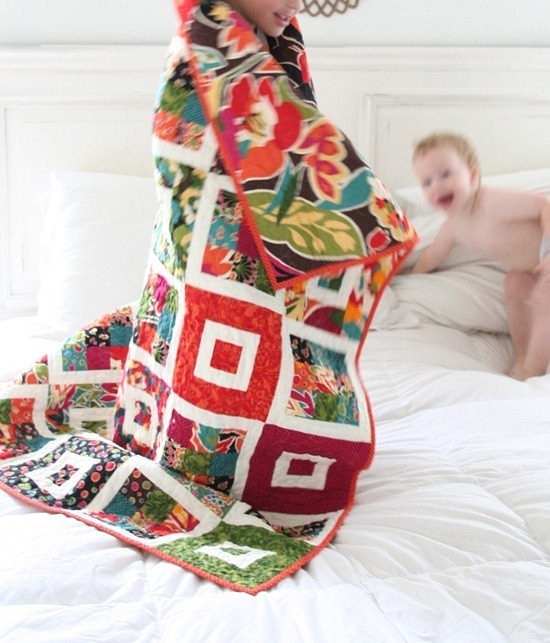 Love the quilt and LOVE the backing even more! what a nice quilt! and i love the pic of the jumping boys! The new quilt is beautiful!!! Love the quilt, it reminds me of Hawaii. We lived there for four years, courtesy of the Air Force, would go back in a minute. Thank you for letting us know about the fabric – i've been looking for it everywhere! Beautiful quilt! Yup, that is some pretty awesome fabric. I'm going to keep this in mind for my next quilt back! I just love this patter! Well, all your patterns- they are so quick and easy to put together. I have my Retro Hello Betty JR that I will use for this particular pattern. Can't wait! That is gorgeous. What a lucky mom!! The whole thing is fabulous!! Oh My! What a lovely quilt! I received a jelly roll of it for Mother's Day and it is not what I would normally get for myself. I was sooooo pleased with it. 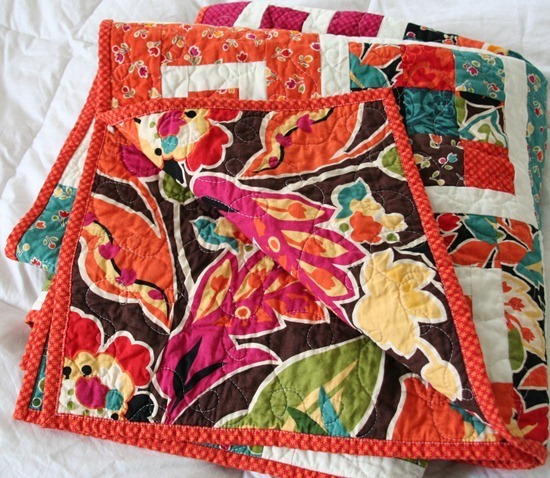 Your quilt for your mom is gorgeous! Your quilt looks fantastic. Love the contrast with white. Fabulous quilt, brilliant backing material. Such a gorgeous quilt! And i love the first picture – looks like fun! Gorgeous quilt! My kids love salt dough, and it's been a while since we've made anything with it. Thanks for the idea! I'm not a kids craft person myself. The girls are suddenly into colouring books and that has been a life/sanity saver for me. Wonderful quilt and the backing is simply perfect! Glad you mentioned White Place – I hadn't heard about it. We will definitely stop by on Saturday. Oooh, that is a really spectacular quilt! I love the colors you used, and the backing is fab!! I love brights and nothing like black and white pops colours. I love the back of this quilt! I am wishing I was your mother! that is one my favorite moda lines– love it!